I was quoted by Digital News Asia on what internet users and website owners should do in view that the Evidence (Amendment) (No. 2) Act 2012 is in force. THE Malaysian Government has gone ahead to gazette a controversial amendment to the Evidence Act 1950 despite the objections and concerns of the online community and civil advocates, who have said it would have a chilling effect on freedom of expression. Section 114A to the Evidence Act was gazetted by de facto Law Minister Mohamed Nazri Abdul Aziz and has been in operation since July 31, according to a notification on the Attorney-General’s Chambers website. (Click here for the PDF documentation). “The law can be enforced now,” said Masjaliza Hamzah, executive director of Center of Independent Journalism (CIJ) in Malaysia, which has been spearheading efforts to see the legislation revoked. However, she noted that even if a law has been gazetted, it may be impossible to enforce it if those who are responsible for it are not trained and are not ready to implement it. “This was the case with the Domestic Violence Act which was passed and gazetted in 1994, but was not implemented until 1996 after women’s groups campaigned to put pressure for that to happen,” she added. Law Minister Nazri gazetted the law despite his own deputy Datuk V.K. Liew conceding in June that more discussions were needed after the CIJ had handed him a petition with more than 3,000 signatures. “Sometimes, laws can be gazetted quietly — unnoticed, you could argue it’s almost by stealth — and we only know they exist when they are implemented,” Masjaliza told Digital News Asia by email. “Many people in Selangor and Federal Territory did not know that Muslim women cannot contest in beauty pageants under the Syariah Criminal Offences (SCO) laws until five young women were arrested for taking part in a Miss Petite contest. “The fatwa banning this was gazetted and therefore can be enforced under the law and these women were arrested for breaching a fatwa. It was only at that point that people heard that there was the SCO Enactment in Selangor and the SCO Act in the Federal Territory, and that they apply to Muslims in those states,” she added. Section 114A, otherwise known as Evidence (Amendment) (No. 2) Act 2012, was passed by the Dewan Rakyat and Dewan Negara in April. Under Section 114A, an Internet user is deemed the publisher of any online content unless proven otherwise. It also makes individuals and those who administer, operate or provide spaces for online community forums, blogging and hosting services, liable for content published through their services. “This presumption of guilt goes against a fundamental principle of justice – innocent until proven guilty — and disproportionately burdens the average person who may not have the resources to defend himself in court,” the CIJ has said. “The amendment’s wide reach will affect all Internet users, websites which provide space for online comments, and any business premises which give free Wi-Fi access to their customers. “In addition, the new amendment was passed despite the fact that existing laws — including the Computer Crimes Act 1997, Sedition Act 1948, Defamation Act 1957, and Section 233 of the Communications and Multimedia Act 1998 — have been used to arrest and charge in court those who commit defamation, criminal defamation, fraud and sedition online,” it said. Malaysia’s law-making process can be very opaque and undemocratic, Masjaliza lamented. “People who are affected by these laws — and we are many — are not consulted at all during the drafting process. We have no idea there’s a draft bill coming, and some of us may hear about it only when it’s discussed in Parliament, and only if the media covers it,” she said. “Then there’s a period of silence. Are Malaysians expected to go to the Attorney-General Chambers’ website every day to check if any laws have been gazetted recently and see how they apply to them? “This is what happens when the ruling government doesn’t believe in meaningful consultation with the public before they enact any law,” she added. After a furore earlier this year over amendments to Elections Offences Act, later revoked, the Malaysian Government promised that public consultations would be the order of the day for future laws. Meanwhile, a lawyer who has been monitoring the issue has advised caution on the part of Internet users and website owners. Users must ensure that their Internet connection or devices are properly secured, said Foong Cheng Leong, co-chair of Kuala Lumpur Bar Information Technology Committee. “They should also frequently update their anti-virus software, use strong passwords and refrain from retweeting or republishing anything dubious or unverified,” he said. “As for website owners, they may want to consider monitoring their comments,” he said. 1) Disable anonymous users from posting any comments. 2) Revise the terms and conditions for use of their websites, to perhaps include an indemnity clause to compel the user to indemnify the website owner in the event of any damages. They may also choose to include a clause prohibiting users from posting comments relating to religion, politics, etc. and that anyone who does that will be banned or have his or her posting removed. 3) Remove Facebook’s comments function as website owners do not have control over the contents posted. 4) Only allow registered users who have provided all their personal details to post comments. 5) Owners of low-traffic websites may consider reviewing comments before allowing them to be posted. 6) High-traffic websites (e.g. forums) may consider appointing someone to monitor or track all postings. Alternatively, they can have a user rating system where users can rate whether a posting is offensive and if so, it gets suppressed/ removed. YouTube has this function. “The registered account holders of Internet services [such as UniFi] may want to reconsider sharing their Internet connection with others,” Foong added. Despite the gazetting of the law, civil society is going to go ahead with the “Internet Blackout Day” for Aug 14 which aims to create awareness among Internet users about the negative impact of the amendment on online expression. Taking its cue from similar efforts in the United States and New Zealand in support of Internet freedom, on that day, Internet users who visit participating websites will see a pop-up window which contains the message of the campaign. In addition, Netizens can change their profile pictures/ avatars on Twitter and Facebook to black, or use downloadable images provided by the CIJ. “We [still] hope to get a buzz around Section 114a and how it’s going to affect the average Internet user, and urge people to do something. We must do something, even if the law’s been gazetted,” said Masjaliza. “Once a critical mass is aware of the law and its implications on them, then it’s easier to get people to support actions under the ‘Stop 114A’ campaign,” she said. “If more people are talking about this and are outraged that this was done without their knowledge, then we will have a good base of support for the next course of action,” she added. The Internet Blackout Day has received positive response from the Internet community. Businesses which rely on the Internet such as the auction store lelong.com.my, online forum cari.com.my, and entertainment portal gua.com.my have signed up to show support, the CIJ said. Other key supporters include online news sites such as Malaysiakini and Digital News Asia, bloggers such as Niki Cheong and Nat Tan. This initiative is also supported by civil society organisations such as SUARAM and the Women’s Aid Organisation. 2. The Facebook page https://www.facebook.com/evidenceamendmentact. 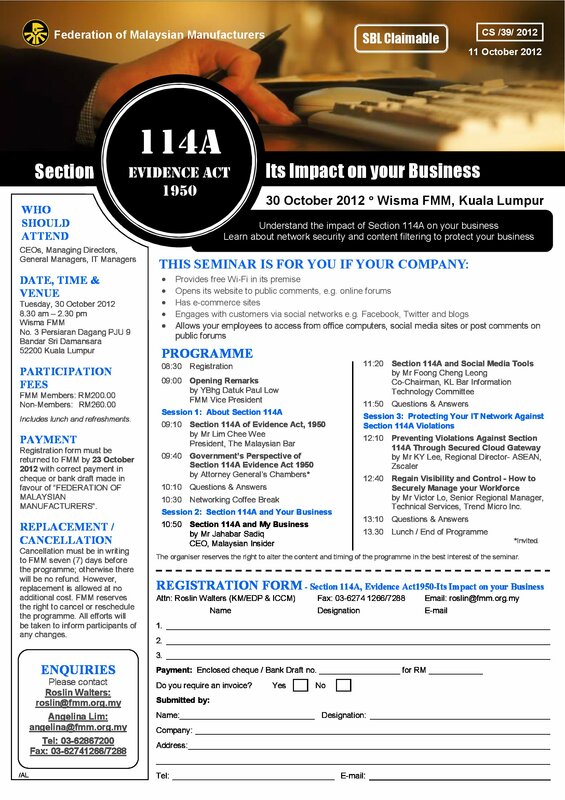 For additional information, please contact CIJ via e-mail at cijmalaysia@gmail.com or call +603-4023 0772.